The aim of this module is to introduce you to the operational and strategic issues that you are likely to face when conducting and implementing research in clinical practice. You will learn how to clearly differentiate between the clinical researcher and clinical practitioner roles and will explore the challenges of undertaking research as a clinician in a practice setting. The module will allow you to critically discuss the ethical and consent issues pertaining to research in clinical practice and will be introduced to research governance procedures and protocols. In addition, it will cover the importance of service user involvement in the research process and the principles of improvement science in clinical practice. You will also learn the key challenges related to the dissemination of research findings and critically discuss how to implement evidence-based practice in the clinical setting. In addition we consider applications from capable individuals who may not have prior experience of working within the health sector but have clear plans for a future career path in clinical academic research. 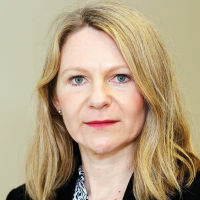 Madeline is a Reader/ Associate Professor and speech and language therapist specialising in quality of life in aphasia who joined City, University of London in 2002.